But, for whatever reasons, the store didn't prosper and Donna decided to shut her business down. We lost touch with each other. Flash forward 8 years and enter Facebook! Here we are, reconnected. Amazing. One of Donna's older relatives (grandmother? I'm not quite sure.) 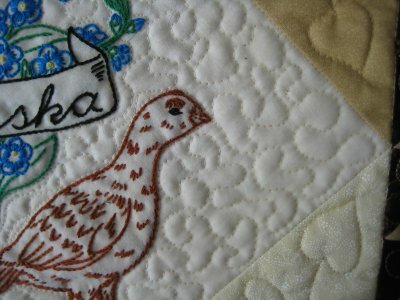 had hand-embroidered many squares of "birds-and-flowers-of-the-states". 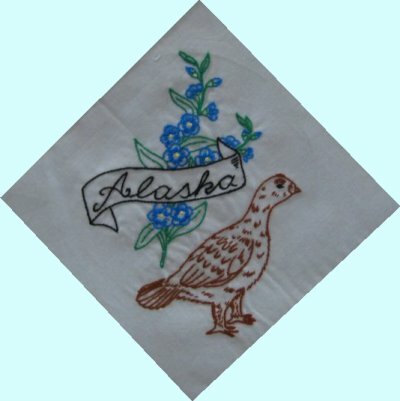 Donna's mother embroidered the few remaining designs to finish the set. As I remember the story, another member of the family was the recipient of all the embroidered squares, 48 of which were set into a top. Donna was eventually asked if she would quilt it. Now, the design area of these squares were about 8" square, which made the blocks themselves somewhat bigger. Some were oriented on-point and some were straight-on. The layout was that each block was bordered by Flying Geese and cornerstones. With 48 blocks and the Flying Geese sashing and cornerstones, the top turned out to be king-sized. 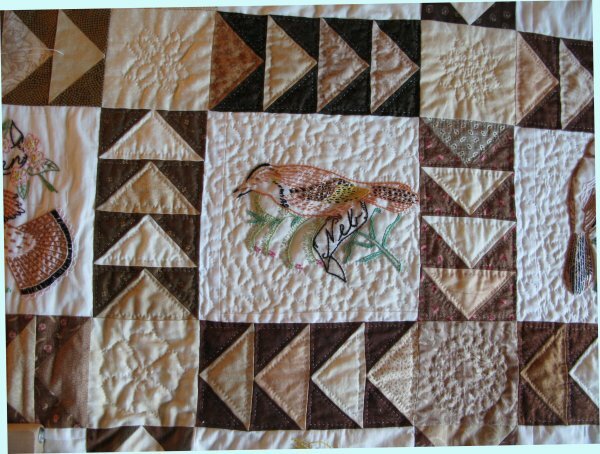 And this is what Donna was going to HAND-QUILT. Now, Donna has a passion for hand-quilting. She'd rather hand-quilt than piece a top. But a king-sized top is a HUGE piece of real estate and she was hesitant to take it on. The family member was persuasive and with the understanding that Donna would take just exactly as long as she needed, Donna agreed. FIVE YEARS LATER, the quilt was done. When I saw the quilt, I was simply overwhelmed. The sheer amount of hand-quilting was beyond description; it was beautiful. What floored me, though, was that Donna *STIPPLED* by hand, no less, the background of the embroidered squares! *Stippling by hand*! Oh. My. Gosh. I don't even sew my binding on by hand and she did stippling. My mind was boggled. 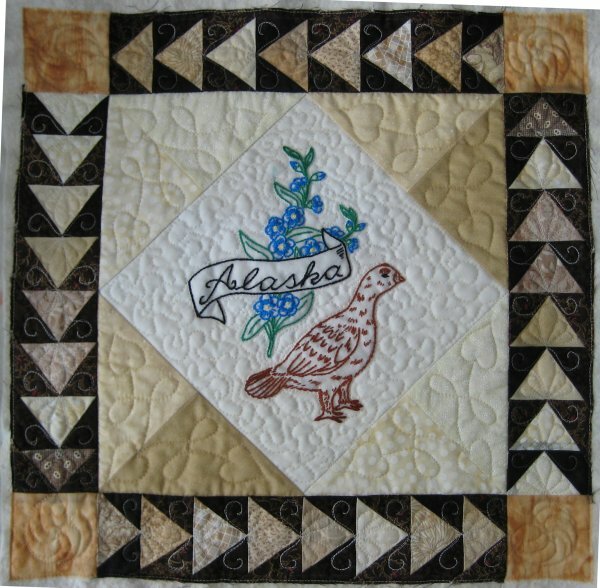 Now, the quilt had 48 of the 50 state blocks. Something needed to be done with the other two but Donna was completely burned out. She didn't even want to look at those blocks and fabrics any longer! My goodness ... who would blame her?? And that's where I come in. 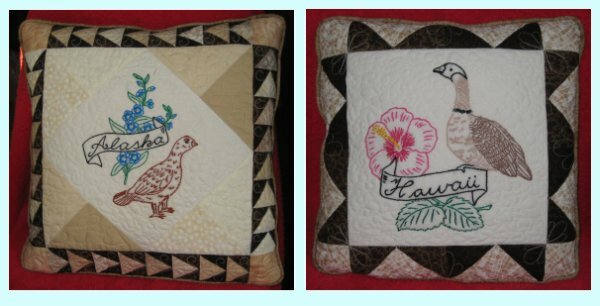 Donna remembered me and asked if I was interested in making two small pillows or quilted pillow shams from the remaining Hawaii and Alaska blocks. Fabric was leftover from the quilt top, so the throw pillows would coordinate. 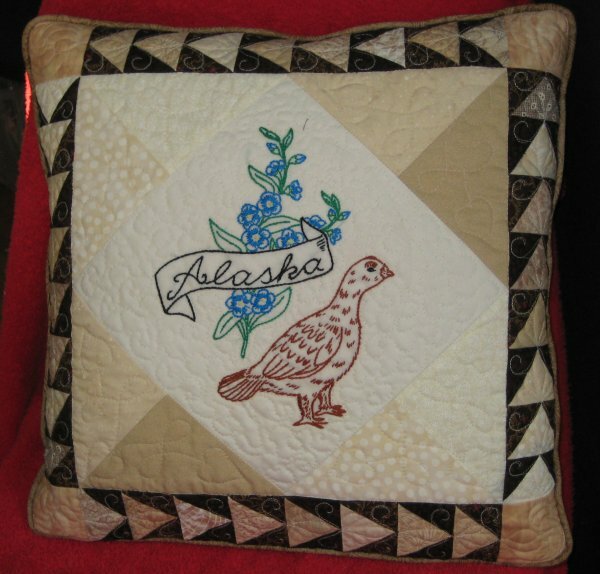 While Donna did the quilting gratis (it being a family project), the family member who would eventually be the recipient of the finished quilt would pay to have the pillows made. Well, of course, I could MAKE them .. but would the cost of them be acceptable? For this sort of project, I charge by the hour. I keep anally-retentive notes regarding my time. Even with a fairly simply layout, I had absolutely NO idea how long it would take me. But Donna assured me that the family member would have no problem with the cost. Hmm. So, I started. Since the pillows were to coordinate with the quilt, my first thought was to replicate the layout that Donna had done. 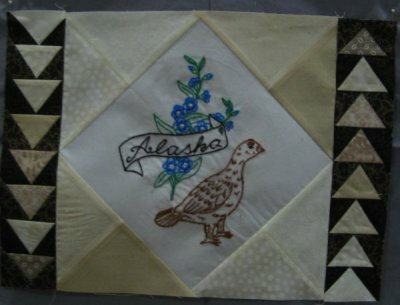 The Alaska block was embroidered on-point. I made scrappy setting triangles to make it square. Then came the Flying Geese borders. This was certainly a non-standard size block. Flying Geese have certain proportions, which were going to be really weird. Rather than make individual Flying Geese blocks with all those weird measurements, I opted to make a freezer paper template, sized to fit. 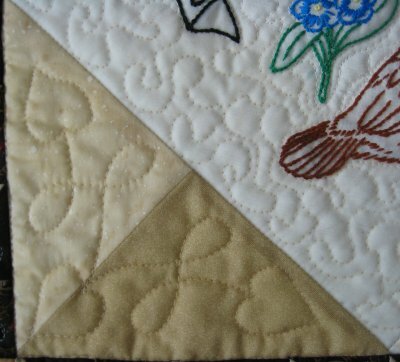 Who CARED what the actual measurements where, as long as the Flying Geese border fit? Using the freezer paper template made my life SO much easier. The cornerstones were attached and the top of the first pillow was finished. Then came the quilting. Following Donna's example, I stippled the background around the embroidery. No, not by hand. Do you think I'm nuts?!?!? and a circular design in the cornerstones. Next came the cording around the perimeter seam and the zipper at the bottom (for easy removal for laundry). Voila! The first throw pillow, an 18" square, was finished. I was very pleased with the outcome. I figured my time and the resultant cost. And nearly had a heart attack. Geez, Louise!! Did I really take THAT long??? I *know* I wasn't dawdling; I was very efficient with my time. (When working on client projects, I am exceedingly anally-retentive about the use of my time. I just do NOT waste it.) But, the time was what it was and the cost was what it was. When working on my own projects, I really do not track my time. It doesn't matter to me how long it takes, so I honestly don't have a feel for how *long* something will take to make. These figures were a real eye-opener. Things just take longer than you think they will. However, for the *next* pillow, I would scale back my original plans to something much simpler ... and hopefully, less costly. 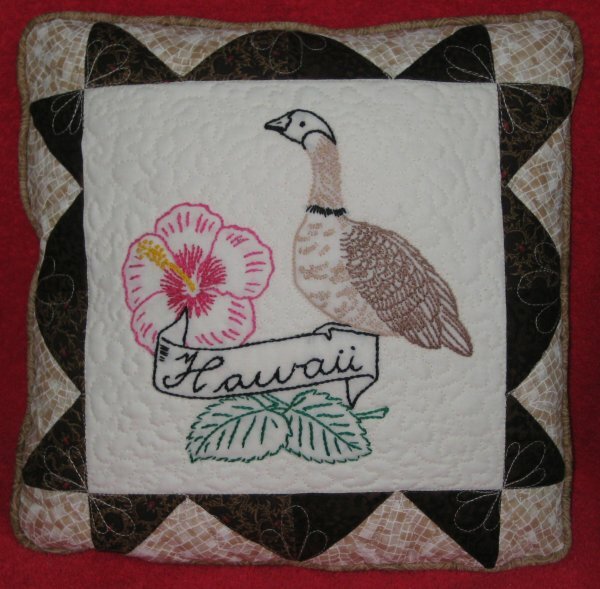 The Hawaii embroidery was done straight-on, so no setting triangles were needed to square it up. In my quest to make this throw pillow "simpler", I created a single border for each side comprised of a Flying Geese block, a half-square triangle and a cornerstone. Once again, I stippled the background around the embroidery. 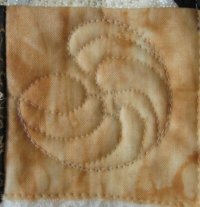 The quilting in the borders were very simple loops. The cording in the seamline and the zipper at the bottom completed the pillow; it finished at 14". I figured my time on this pillow and was gratified to see that the smaller, simpler pillow was, indeed, less expensive than the bigger, more elaborate pillow, but it was *still* more than what *I* would have paid for a throw pillow! (Then again, isn't that the way most crafters think? "I can make that for less" but we don't quite include our time?). I was feeling more than a bit anxious over the total cost. After all, I hadn't secured the approval of the person who was going to be paying for it. Was this a tactical error? Donna reassured me that, no, the family member would be able to pay for it without a problem. Via the magic of being distracted on the internet, I came across an Etsy listing for a pillow cover. Just the cover, no insert. It is made of felt octagons machine appliqued onto a wool fabric backing. No quilting at all. The asking price? $140. Oh. My. Gosh. $140. Just for the COVER. I'm fainting. I was very happy the recipient liked the pillows and it was a nice change of pace for me.